Sandra Bullock, in the title role of Debbie Ocean (Danny Ocean’s sister), leads an all-star cast in Ocean’s 8. Having served a little over five years in prison, a tearful Debbie is paroled, promising the parole board that all she wants to do is live a simple life. As she’s checking out and gathering her belongings, it quickly becomes clear that Debbie intends to do anything but live a simple life. To the audience’s delight, she immediately begins pulling off small cons that wind up with her carrying a large number of shopping bags filled with luxury goods into her free 5-star hotel room. Teaming up with her former partner-in-crime, Lou (Cate Blanchett), Debbie reveals her plans to steal a Cartier necklace valued at $150 million from the neck of a famous actress (Anne Hathaway) at no less than the high-security Met Ball. What follows is a series of capers as the women gather talented team members and as they carry out their plot, they discover there are serious setbacks that could ruin their plan. Lou finds out that not only does Debbie want to steal a necklace, but she wants revenge on the man who put her behind bars, all accomplished by the heist. The action is non-stop and the cast is outstanding, from beloved veteran actors such as Bullock and Blanchett, as well as Helena Bonham Carter and Sarah Paulson, to newcomers such as Awkwafina and Rihanna. However, it’s Anne Hathaway who steals the movie, with her multi-faceted portrayal of the egotistical diva Daphne Kluger. Daphne is so full of herself and such a temperamental person that we never know what she’s going to do next. Hathaway plays this to the hilt, with so much range of expression that she commands attention as she fascinates with her unexpected behavior. 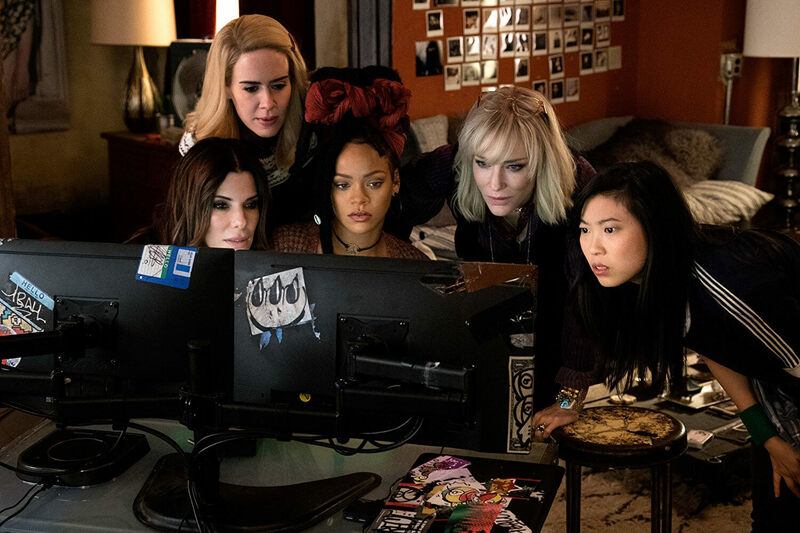 If you have seen Ocean’s 8 and would like to rate/review it yourself, click here. Okay “stan the man” who is clearly a troll. No. This movie does not need more guys. The point of Oceans 8 was too include more women in leading roles in hollywood because there are TOO MANY GUYS – specifically WHITE MALE GUYS playing the lead for decades. Okay?? Haha! Jane. OMG learn to spell. Also – NOOOOOOOOO (big sigh). Making a movie just so the entire cast can be women is a terrible idea. I’m all for equal rights, but I am against terrible movies. The first Oceans movie was fine, the rest were okay, but to make a whole new dumb movie for a (fourth??) time and have the same plot and just make all the characters women is DUMB. BY YOUR LOGIC – There should be an Oceans 9 & 3/4s with a cast of disabled black aboriginal / transgendered women. Would you like to see that movie???? Didn’t think so. @Stantheman you are a RACIST! You are also probably a white male. I told you – I think you are a racist. Grow up.